Product #2383 | SKU BETM300 | 0.0 (no ratings yet) Thanks for your rating! Setting up amps, dialing in tones and positioning mics takes a lot of time and patience. Why not step on a Tube Amp Modeler TM300 and skip straight to the good part? With three classic tube amps, three (3) gain modes and three (3) mic placements to choose from, the TM300 puts 27 combinations of some of the most sought-after tube amp tones right at your feet! In this one simple pedal, you can call up the sound of a coveted tweed relic, a clean Californian classic or a roaring British powerhouse. You then apply your choice of the three different gain modes, and even control virtual mic placement. And with its dedicated Level, Low, High and Drive dials, the TM300 allows you to take any of these historic tones and shape them into something uniquely all your own. 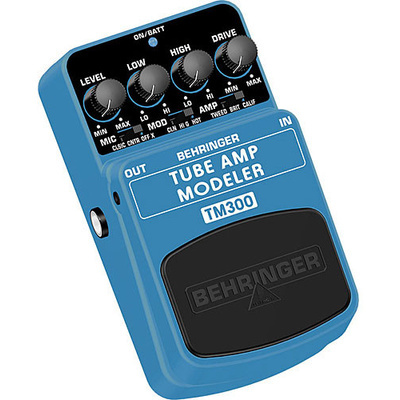 The bright, blue LED tells you when the TM300 is activated, and the top-quality on/off switch maintains incredible signal integrity in bypass mode. You can power this little “jack-of-all-trades” with either a 9 V battery or our PSU-SB DC power supply (not included).